Our most versatile Air Tent. The Aerodome 1+ features huge living and sleeping areas combined with a convertible front awning space. Zip away awning floor, allows the front area to be converted into an additional bedroom when required. Large removable rear edroom can be divided in two, to allow multiple sleeping arrangements. A truly expansive central living area that provides extra space when it is too cold, wet or hot to sit outside. The inflatable cross ubes create an increably strong structure, making areodomes one of the most stable dome tents we have produced. Black out privacy pods create a darker sleeping area allowing for more sleep in time during early morning summer sunrise. A very good tent, made out of good materials, very light for its size. It has handled some of the worst of British weather already. Very strong gusty gales, intensely heavy rainfall and near frost. The main body is up in unde 5 mins, which makes life easier is foul conditions and if your late and tired. It takes down just as easy and the good strong, easy to use tensioning straps make packing into its bag a certainty. It's worth a look. The perfect tent for my wife and I. Ample room for everything we need and more. Excellent quality fabrics and production. 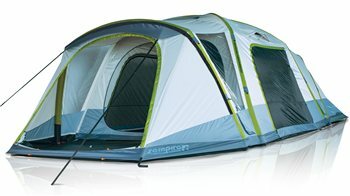 I would strongly recommend to anyone who is looking for an inflatable tent to look at the Freedom\Zempire range.